Which letter of the alphabet suddenly appeared on Antonio’s forehead after his accident? Hint 1: R.I.P., but where? Hint 3: One letter IN CAPS. If you know the answer you also have the password to Bizarre Facts 😉 Enjoy! Haven’t read the book yet? 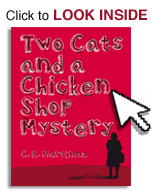 Two Cats and a Chicken Shop Mystery is now available on iTunes, Amazon, Sony Reader Store, Barnes & Noble, Smashwords, Kobo and Diesel Bookstore.